Microsoft is going for the low-end of the personal computing market with a smaller, cheaper Surface Go tablet that takes on Apple’s cheapest iPads. The Surface Go has a 10-inch screen, about the same size as the entry-level iPad. At $399 (R5 386), the device is $400 (R5 400) cheaper than the current Surface Pro tablet, but has slower Intel processors and about four hours less battery time, Microsoft said. The new tablet weighs 521.6 grams, far lighter than existing Surface products. It goes on sale on August 2 with Wi-Fi connectivity. Cellular versions are coming later. Like Microsoft’s earlier devices, the Surface Go will work with an optional keyboard and mouse. The company announced cheaper versions of both accessories on Monday. For the first time on Microsoft hardware, the Go will use the USB-C charging standard. The new tablets come in multiple configurations, including 64, 128, and 256 gigabyte storage options and 4 or 8 gigabytes of RAM. Prices range from $399 to more than $549. The sub-$400 price point is key for Microsoft as it tries to turn its Surface business into a more serious challenger to other computer hardware makers. Cheaper devices can attract students who get comfortable with the technology and spread it to the workplace after they graduate. That strategy has helped Apple, which unveiled a $299 iPad earlier this year for schools. Google has also seen some success with its low-cost Chromebook laptops. The Surface Go is still more expensive than the cheapest iPad, but the Go tablet is compatible with professional features, like the detachable keyboard, that are missing on the entry-level iPad. Bloomberg News reported on Microsoft’s new tablet line in May. 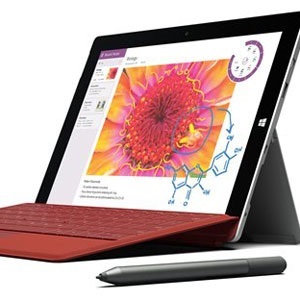 Microsoft released a $499 Surface 3 tablet in 2015 but discontinued the product in 2016. The software giant kicked off its consumer hardware push in 2012 with the launch of the Surface RT. These tablets didn’t resonate with consumers, so the company focused more on pricier Pro models. So far, Microsoft has struggled to make a hit Surface product. The business generated $4.4bn in revenue in the past four quarters. Apple sold $20bn worth of iPads in the same period.